December has been (and always is!) a busy month. Faced with several work-related deadlines, Christmas preparations, and an even more hectic family schedule than usual (how can two little girls be involved in SO many things?!?! ), there isn’t much time left over for birding. Or anything else, really. Fortunately, winter can also be a busy time for visiting birders in Newfoundland, drawn by the lure of northern migrants, finches, and rare gulls. And sometimes that means an excuse for me to join them. My first real “break” this month came last week when birder Paul Lagasi (Ottawa, ON) requested my help for a short two-day visit, aimed primarily at seeing the elusive Yellow-legged Gull but also a variety of other local specialties. Paul flew in on Monday, December 8 and had a few hours to poke around on his own. With a few simple directions, he scored an ABA lifer right away – Black-headed Gull. He also enjoyed his first ever views of adult Iceland Gulls … loads of them! Thousands of “Kumlien’s” Iceland Gulls spend the winter in St. John’s, providing world-class opportunities to see and study this very northern species. The variation within this “complex” can be … well, complex. But fun! While gulls would remain the focus of the next two days, our first stop on Tuesday morning was Cape St. Francis at the northern tip of the peninsula — in search of seabirds. Although things were pretty quiet, we did find several dozen Common Eider, small groups of Long-tailed Duck, three Common Murre and a handful of Black Guillemot. A Bald Eagle kept watch from atop some offshore rocks, and Great Cormorants buzzed by from time to time. But the highlights, and our main purpose for heading out there, were several Dovekie flying around and actively feeding right off the point. They played hide & seek with us for more than an hour (mostly winning!) before we headed back to town. An early morning trip to Cape Spear on Wednesday morning was a bust for seabirds, although the scenery was awesome as always and a few small flocks of Purple Sandpipers were fun to watch. 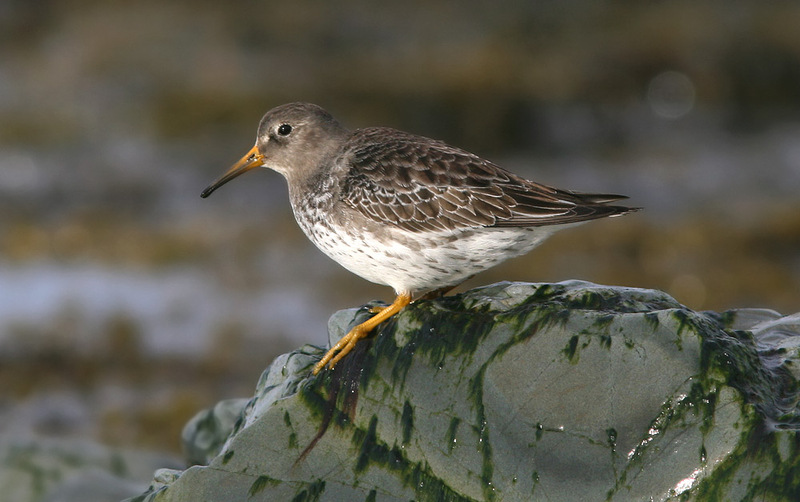 Purple Sandpipers (like this one photographed a few years ago) also winter along our coast. They are very hardy shorebirds, eking out an existence in the toughest of habitats. 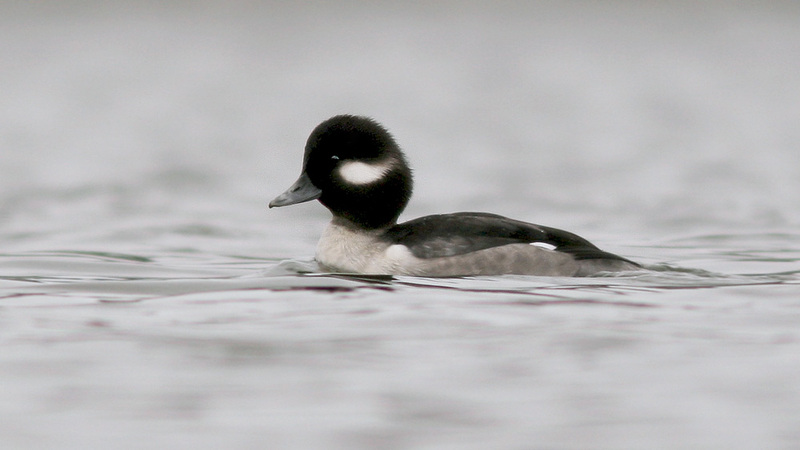 This female Bufflehead was a bit of a treat for me … pretty uncommon within the city and not so easy to photograph. I think Paul (from Ottawa) was entertained by the fact that I paid more attention to it than the many European ducks! My second little break was Sunday morning, when I managed to sneak away for less than an hour between family engagements! 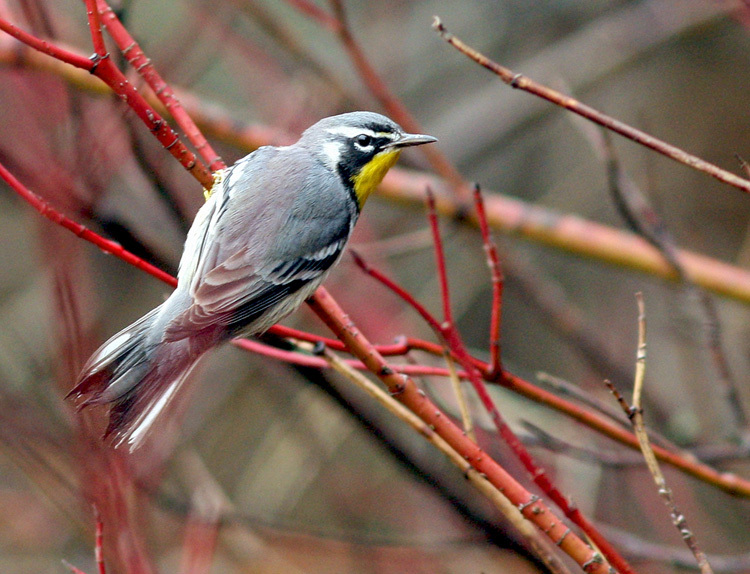 A Yellow-throated Warbler had been found at Kelly’s Brook earlier in the week by local birder Peter Shelton, and I hoped to catch up with it. 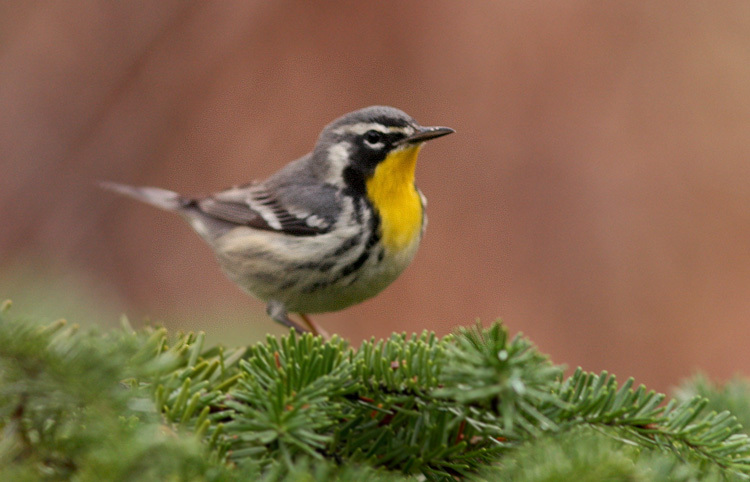 Surprisingly, this southern warbler shows up in Newfoundland pretty much every year and are regularly reported in early December (often visiting suet feeders). It was dull and overcast when I arrived, making for for pretty low light. It was also incredibly warm for December, with temperatures well above freezing. There were already a handful of birders/photographers there and the warbler was being quite cooperative, busily gleaning insects in the tangly understory that lines this neat little brook. The looks were great, but the bird was active, the habitat so tangly and the light so low that great photos were nearly impossible. Here are a few of my better captures during the mere 45 minutes of freedom I had to share with it. 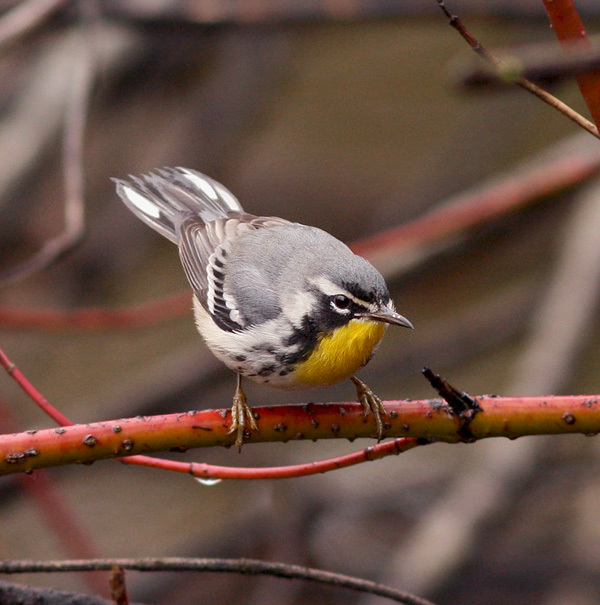 This entry was posted in Birding Tours and tagged birds, Dovekie, Gull, Newfoundland, Photography, St. John's, Tours, winter bird list, Yellow-throated Warbler. Bookmark the permalink. 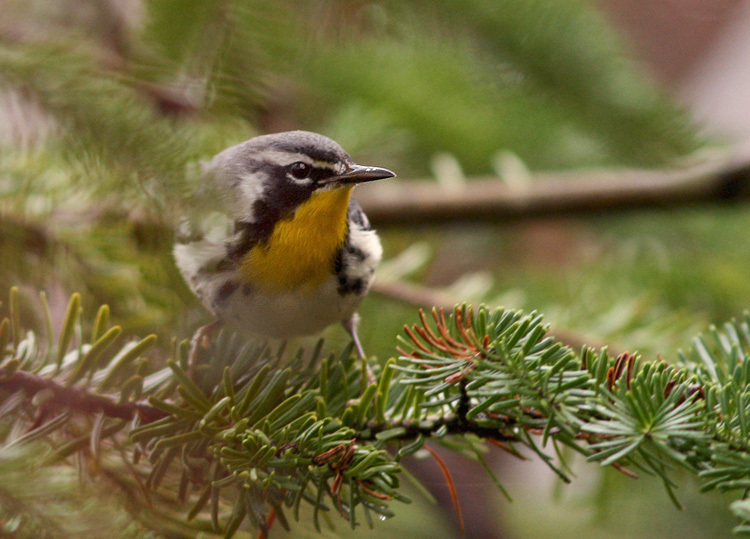 Love the yellow-throated warbler photos…especially surrounded by the green pine. Very Christmassy!